Gregory Polovin is an associate in the firm's Real Estate practice. He has experience in all types of real estate transactions, including acquisitions, dispositions, first lien mortgage and construction loans, mezzanine loans, refinancing and purchase money financings. He represents and advises owners, developers, investors, lenders, borrowers, landlords and tenants in a diverse and dynamic blend of complex real estate transactions encompassing all phases of real estate acquisition, development, financing, restructuring, leasing, disposition, joint ventures and investment. 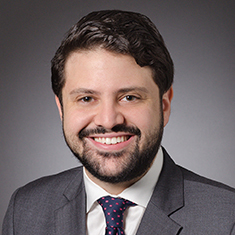 Gregory graduated from Brooklyn Law School on the Dean's List and was the recipient of the Samuel Kirschenbaum Prize for Excellence in Real Estate Practice, and the Judge Doris A. Thompson and Judge Edward Thompson Award for Excellence in Trial Advocacy. He completed his undergraduate studies at Boston University, where he received his Bachelor of Science. Prior to joining Katten as an attorney, Gregory was an associate at Wachtel Missry LLP.